This post is out dated. Please refer to other streaming products of our company. Are you streaming media content via Windows Media Services? Streaming video? Broadcasting via TV set top boxes? Maybe running your own online radio? WMS does a good job for that, but there are some things you need to get your business more profitable. You just have to get some statistics for your users’ streaming process. That’s because you need to know who you work with. You also need to protect your proprietary content against some re-streamers and prevent the content theft. We provide WMSPanel, the tool and the service for both tasks. 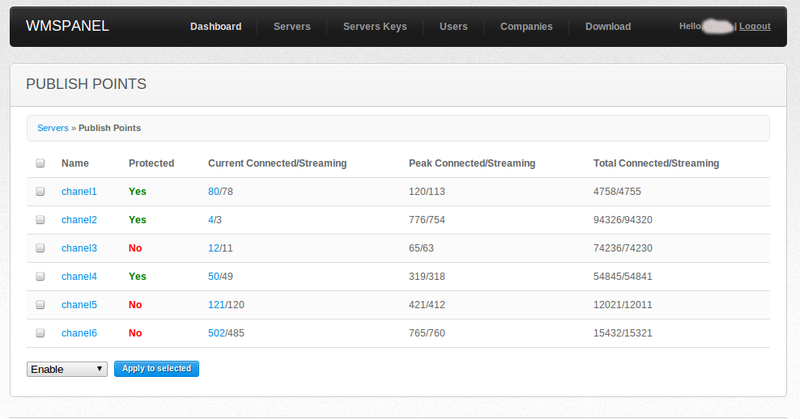 Gets the statistics from your servers and publish points. Shows real-time graphics for connections and streams. Lists current streaming content with client IP and port data for each publish point. Shows suspicious IPs that are probably re-streaming your content. And with our WMSAuth plugin being embedded in your system, WMSPanel can enable your content protection - so no thieves will ever get your content for free! Read more on WMSAuth plugin web site. We can make on-site installation and you can monitor your servers using your own infrastructure. Or you can use our servers to process and to monitor your data. You just rent our solution for any period of time. Try the first 2 weeks for FREE. Sign up in 10 seconds! Contact us so we could guide you though the installation process. See the next post - "Installation" - to get started.